How Do Blind People Exercise? So How Do Blind People Exercise? When I worked in London, I got daily exercise without even thinking about it. It was a 30 to 40-minute walk to the train station, which I usually power-walked with my guide dog. This wasn’t really to keep fit, but just because we enjoyed it! Then there was a 40-minute train ride followed by a 10 to 15-minute walk to the office. Anyway, apart from days when it was pouring rain, or snowing, I really enjoyed these walks. Still, over 2.5 hours of travel every day is a lot. I was always happy when I negotiated a working from home day. Partly because I didn’t have to commute, and partly because I felt I made much faster progress at home than in the noisy open-plan office. When I decided to set up my business, I still took my dog for a walk, but I didn’t miss the commute. However, as my dog grew older, the walks were usually not as long as the trip to and from the station. I realised at this point I needed to do something more for my fitness. So I invested in an exercise bike to make sure I got my daily exercise. This was something I could put in my spare room and use it whatever the weather. Well, buying the bike was the easy bit. I said I’d use it when I had time, which often meant free time never came. Planning to do exercise when you have time is a bad idea! When I moved in with my boyfriend who owns a cross-trainer, I brought my bike with me. In terms of my exercise routine, I decided something needed to change so now I put it in the diary. Like a meeting, I have to attend—Monday to Friday—every day. It’s ok if the meeting gets put back a couple of hours, but the meeting has to happen! Only then can I click away from the Outlook reminder and know that the job is done! This is important to me, partly because I have a desk-based job without the benefit of walking to work. Also, there are considerations with being blind where you sometimes have to be a bit more proactive if you want to stay fit. While I’ve heard some positive experiences about blind people going to the gym. I’ve also heard of people struggling with staff who are not particularly helpful, or machines that are not accessible. 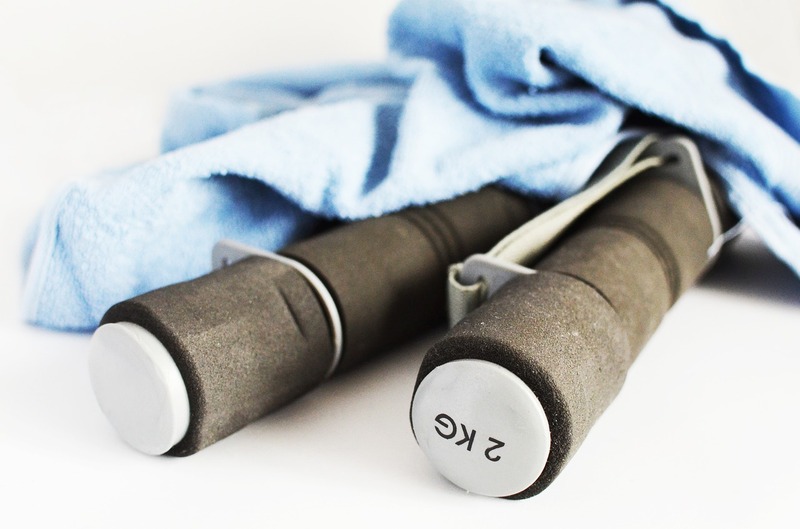 I would rather make the initial investment in exercise equipment and have it at home, for my personal use. There is nobody who will change the settings making it harder for me to use. I don’t have to queue which machines are available or take time to travel to and from the gym. Ok and I don’t have to listen to anyone else’s music choices either. I listen to my own music or podcasts to make sure I don’t get bored! As I can’t use the display on either machine, I generally do 20 minutes on the bike and 45 minutes on the cross-trainer. I use the step counter on my iPhone to measure the distance and I like to use the app from Withings. The Withings app is generally accessible, apart from some buttons that I labeled myself. I don’t use all of the functions, but I can keep track of how far I’ve gone each day, which is what interests me. For anyone who wants to measure their blood pressure or heart rate, the Withings wireless blood pressure monitor is fully accessible because you use it with the app. Personally, I think this is a better alternative than some of the talking blood pressure monitors. Since you can store your activity, heart rate, and blood pressure measurements in the same place. Whereas some of the so-called accessible talking stand-alone devices say in the instructions that you need sighted assistance for some functions. I tried a wrist tracker device, but it annoyed me because it didn’t seem to track all of my steps. Also, I could only read my progress score when I synchronised the device with my phone, which was a faff. I’d much rather check the total going up in real-time on the app. However, if you can see enough to read the screen of the device, it might be ok for you. Here’s the link for the Withings Pulse activity tracker. It’s good to do other physical activities as well. I enjoy going for walks, have been on tandem and canoeing holidays and used to ride horses as a child. However, I see these things as additions, whereas I need a plan to make sure I get enough exercise. Being able to do so whenever I need it, without relying on someone else being available. For me, the exercise regimen with the bike and the cross-trainer is the ideal solution. I have heard about some audio exercise classes specifically for blind people, which means that the exercises are described. This is something that I would be interested in exploring because I can’t follow normal fitness videos or YouTube classes. If I decide to try them out, I’ll report back later here. I know there are many blind people who are interested in sports and who play team games or take part in local activities. I don’t really do this, because I need my fitness plan to fit in with my schedule, and for me, it’s about keeping fit rather than finding additional social activities. I think there are a fair number of blind people who struggle because they haven’t yet found good and accessible ways of keeping fit. However, exercise bikes don’t have to be expensive, especially if you’re not looking for features on the electronic display. When you consider the price of a gym membership, I think they are a good investment. If that is too expensive, finding a friend who can describe exercises and then write them down is also a good workaround. If I’m away on business and don’t feel like investigating the hotel gym on my own, I often use these exercises from the NHS fitness pages. However, I still think it’s a good idea to get someone to check the first time that what you are doing is in line with the images on the page. Kirsty lives in England and runs a business teaching English to German-speaking adults. You can learn more at her website. To view the comments associated with this piece and Explore more of Kirsty’s writing, you can visit her blog. 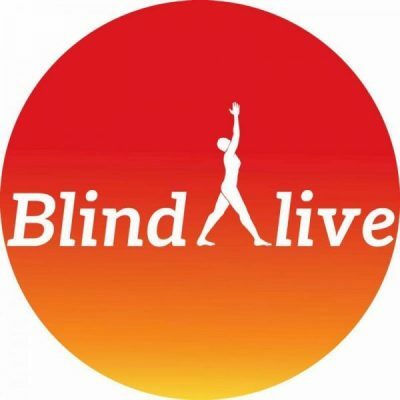 And of course, BlindAlive would love to have you share your comments and impressions with them. You can comment on their Facebook page, follow them on Twitter, or subscribe to their informative chat list. Summer is almost here and if you struggle with controlling your food portions today’s post has some excellent tips. This post by Lisa Salinger of Blind Alive was originally published on March 12, 1017. Does the mere mention of the term make you cringe? Controlling portions is difficult for everyone, but I believe it is even harder for people who are blind or have low vision. I’m here to give you some helpful tips so it doesn’t have to be such a chore. When faced with a situation where you are not sure how much to eat, there are three basic things you can do. When you are preparing your meals at home, you have a great deal of control over your portion sizes. Though it may be tedious, I find it helpful to weigh and measure my food. I find an ice cream scoop with a lever especially useful for this purpose. The lever makes getting the food out an easier and quicker process. You’ll want to confirm this is the case with the one you have, but generally, a level scoop contains one-fourth cup. You can also buy scoops for making cookies that are great for easily measuring condiments or smaller amounts of ingredients. I have a scoop that measures one tablespoon and is ideal for nut butters. If you want to get the entire family involved, you can also buy serving spoons designed to measure in one half, three-fourths, and one cup sizes. I also have a few fourth or half cup containers with lids that are great for storing individually sized portions of snacks. Don’t know how much of a specific food you should have? You can consult sites like My Fitness Pal, and Calorie King, which also have their own smart phone apps. You might want to consult a nutritionist to learn about the amounts of various foods that might be best to eat. Contact a state agency or Association for the Blind. These agencies can connect you with a rehabilitation teacher to teach you how to weigh and measure your food. Many of the catalogs with products for people with low vision sell talking kitchen scales and tactile measuring cups. To find serving sizes and calories in many packaged products, check out Directions for Me, which has an extensive database of foods. Though it takes some time to figure out portion servings when I am at home, the real trouble starts when I eat elsewhere. In those cases, I find I need to ask for help. I might ask the server at a restaurant to suggest a meal that is on the smaller side, or I might order from the Senior Citizens’ menu. Generally, portion sizes at restaurants are nearly twice the size of what we need, or what we would eat at home. If I can’t easily tell with my fork or a carefully placed finger, I may ask questions like, “Is that a half or a whole chicken breast?” I’ll also sometimes ask the server about how many ounces the entrée is if I haven’t already found that information on the menu. I often ask for a small to-go container to be brought with my meal. I try to save roughly a third to a half of what I’m having for lunch, with the exception that if they are separate, I eat all my vegetables with dinner. Sometimes, you are eating at someone’s home, and maybe the food is unfamiliar. Or maybe it’s a buffet, and the order of the day is a dab of this and a bite of that. Sometimes, the best you can do is to make the best choices you can and move on. While this shouldn’t be an everyday occurrence or give the rationale to be completely unrestrained, there’s also no point in obsessing over those things you don’t know and can’t change. If you’re spending time with people you care about, let that be your focus, not how closely you stuck to your goals. If you choose more fruits, vegetables, and lean meats, then you have a bit more overall leeway. 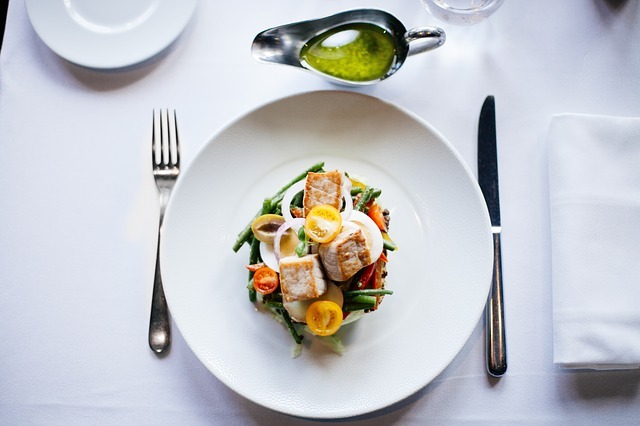 Ultimately, it’s important to remember that you are controlling the portions and making the decisions that will aid you in living your best and healthiest life. If you have more suggestions for making portion control easier, please let us know. You can comment on our Facebook page, follow us on Twitter, or subscribe to our informative chat list. The image is silverware, napkin and white dinner plate with a small portion of a chicken salad centered on the plate. A silver sauce-boat containing salad dressing is above the plate. Being Enough What Does It Mean? These questions have been churning in my brain consciously for years, and probably subconsciously all my life. Well, I have been pondering on it long enough. I have some ideas that might help sort it out. To say, “I am enough” is a very different statement than, “I have enough.” We can quantify “having enough:” there is enough food, shelter, or whatever it is that is required. “Being enough” is a bit more elusive. It is a state of mind. To be willing to say, “I am enough” and truly believe it, even for an instant, allows for a feeling of inner spaciousness; a peaceful expansion of consciousness. I could easily tell you at this point to do twenty affirmations every day saying, “I am enough,” and eventually you will feel better. This absolutely can be an effective practice. I use it myself but I want to introduce another idea. Are We Being Realistic In Our Expectations? A few weeks ago, I had a conversation and the person said to me, “I am sad because I am not enough.” Usually, I might have said something like, “Of course you are, look at all the people you have helped and influenced over your lifetime.” There are a lot of dismissive remarks I could have made. This time, however, what shot out of my mouth was, “You are right! You are not enough and you never will be, so get over it!” I felt kind of shocked when it spilled out of me, but I realized the truth of the statement immediately. How can any of us ever be “enough” when the To Do List is infinite? How can we be enough when we feel “less than” due to blindness, deafness, or a thousand other physical conditions, or when the size of our pants aren’t the size we have decided is the perfect one? How can we ever be enough when we measure ourselves by a superhero we have conjured up in our own minds? How can we be enough when the mark moves up as soon as we reach it? We can’t! There is no way! Therefore, to be sad about not being enough means you will be sad about it the rest of your life. That does not work for me. The way I see it is I can either drop the thought, “I am not enough” and even drop the thought “I am enough.” They really are not useful because a measurement is inherent in both statements. I propose we drop them both. Can you imagine that? You never have to be enough again and you never will feel sad again because you are not enough. “Being enough” is no longer a measurement that applies to us. For me, a whole world of guilt-free possibilities just opened up. So much inner space can be created if we get over “being enough.” Let it go and observe how you feel. Take it in and you might breathe easier. BlindAlive would love to hear your reactions to this post. You can comment on their Facebook page, follow them on Twitter, or subscribe to their informative chat list. 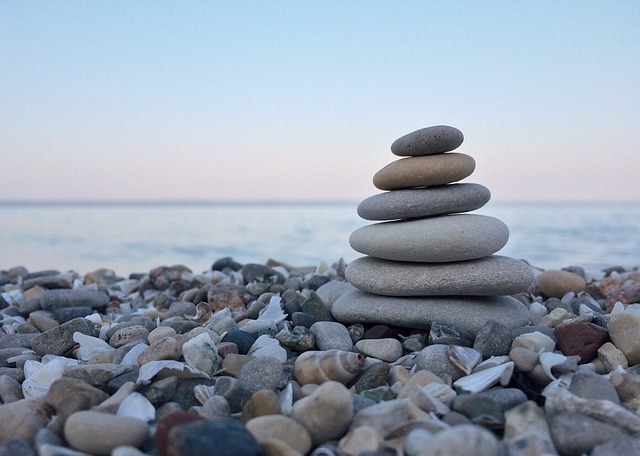 In the photo are 6 flat stones atop one another decreasing in size to convey balance. The stones are sitting on a rocky beach in the foreground. In the background is the ocean and the pastel colored sky is on the horizon. The color palette is a calm, soothing one in softly muted grays, blues, pinks, and whites. Originally published on BlindAlive by Mel Scott. Mel is a regular featured guest and Woman On The Move. This is a common problem in our community, mainly because the choices for well-described programs have been almost non-existent. I have made it my mission over the last two years to create choices for people at all fitness levels. It is crucial that we move our bodies regularly so we feel healthy. The Gentle Workout Set is the first of three options I recommend. The set has four short workouts and you can do them standing or in a chair. There is a section that requires standing next to a chair. These workouts introduce you to basic cardio and strength training moves. You can do a different one every day. A detailed description can be found at our site. Pilates Chair With Ring is another great place to start with. You use a chair for the entire workout and it works your whole body. It makes use of a Pilates ring, which is a springy ring with foam handles. The ring can be found at sporting goods stores or through this website, and you can learn more about the workout by visiting our site. Gentle Yoga For Beginners is where you want to start if yoga is your interest, and being on the floor is okay for you. The entire sequence is on the floor, so there are no standing poses. Once you are on the floor, you can stay there until the end. This flow is great for warming joints and talking you through basic breathing and foundation poses. This link will give you all the information you need to get started. I think these three options are good places to start for those who have never exercised or who need to ease back into activity with Eyes-Free Fitness®. I suggest that you try these and then you can move to the Level One workouts. We will discuss these more in an upcoming post. We want to support you in every way we can to feel better than you do now. You may contact us through our Facebook page, on Twitter, or on our BlindAlive Community on Facebook.